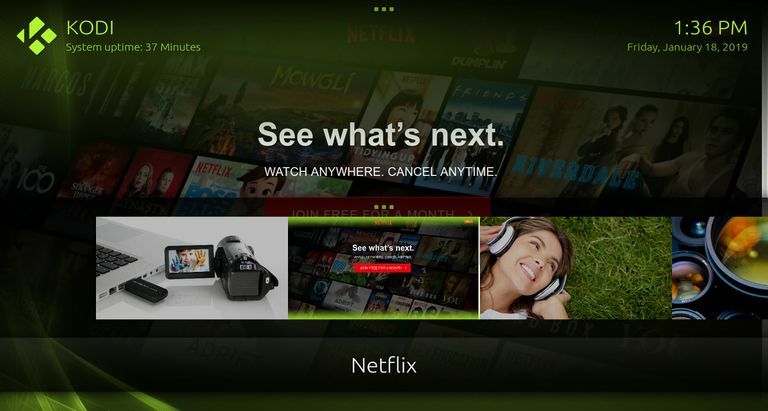 Recent developments in incorporating DRM into Kodi have allowed legitimate add-ons for Netflix and Amazon Prime Video to enter development for the latest releases of Kodi 18, Leia. There's also an add-on for Playstation Vue available in the default Kodi repositories. While the Kodi Netlifx add-on and others are early in development and potentially unstable, there's a tried and true approach you can count on to launch your favorite streaming services within Kodi using Google Chrome. As long as you're running Kodi on a computer with Chrome, you can use the Chrome Launcher add-on to open Chrome inside Kodi and access nearly any streaming service. Before you get into Kodi, you're going to need to download the Chrome Launcher add-on. Open you browser and go to the Chrome Launcher Github repository. Select Clone or download to the right of your screen. A new menu box will open. Select Download ZIP at the bottom. If your browser prompts you to open the ZIP archive, don't. You're going to install the ZIP directly into Kodi, so just save it. Now, open Kodi. When Kodi first opens up, select the gear icon above the category listing on the left side of the screen to open Kodi's settings. Select System settings in the lower right corner of your screen. It's the one with the gear and screwdriver icon. There are a list of categories down the left side of the Kodi system settings screen. Select Add-ons. Toggle Unknown sources on. Kodi will warn you that enabling unknown sources is potentially dangerous. Agree, and continue. Back out all the way up to the Kodi main menu. Select the Add-ons tab in the menu. You'll arrive under the Kodi add-ons section. At the top of the category list on the left, select the small open box icon, then select Enter add-on browser. You'll need to it to install the Chrome Launcher ZIP you downloaded. You'll see several options listed in the body of the add-on browser. You're going to install Chrome Launcher from a ZIP file, so select Install from zip file. Kodi will open a new window with a list of sources. Select either your Home or My Documents directory since downloads are saved under it. Navigate to your download directory. If you saved the Chrome Launcher ZIP elsewhere, make your way to that directory. When you've located the ZIP, select and install it. Kodi will bring you back to the add-on browser and show you a success message when Chrome Launcher is installed. Back out to the main Add-ons tab in Kodi and select the Program add-ons tab on the left. Select the Chrome Launcher icon to the right to enter the Chrome Launcher. You'll arrive on the Chrome Launcher page in Kodi. Select Add Website at the bottom of the list. The add-on developer has already provided two launchers ready to use: Youtube and Vimeo. If you select either, the website will launch in full screen. Press Alt+F4 to exit either. Kodi will immediately open a new overlay for you to enter a title for your new launcher. Name it after the website you want to open. Otherwise, it's easy for this to get cluttered and confusing. Next, Kodi will switch to a URL overlay. Enter the exact URL of the website you want to launch. The default only uses "http://." Make it "https" yourself, if you'd prefer the secure connection. The next screen will ask if you want to stop playback when you launch Chrome. This one's entirely up to you. The default is fine, if you're not sure. The last step asks you if you want to launch Chrome in kiosk mode, which removes all the borders and other web browser controls, allowing you to only see the website content itself. This one is an absolute must for streaming video, so leave it as "yes." Chrome Launcher will finalize your new launcher and return you to the list. You'll notice your new launcher is available now. Try starting your new launcher to see that everything works as planned. You should see the website you configured open in full screen. After you sign in, save your password in Chrome. The next time you open your launcher, you'll arrive right in your account, ready to start watching. Enjoy your streaming services directly through Kodi! As long as the service supports Google Chrome (most do), you can watch seamlessly. With the right Kodi themes, you can also create custom shortcuts for your launchers on the Kodi home screen. Install Exodus on Kodi and Watch Everyting! Kodi Stopped Working, Now What?